Martin Samuelsen in action for Posh at West Brom. Photo: Joe Dent/theposh.com. Talented teenage midfielder Martin Samuelsen has returned to West Ham after a six-month loan spell at Peterborough United. 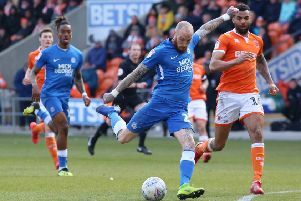 Samuelsen started just nine games for Posh in that time - he was used as a substitute 11 times - and scored two goals, both excellent strikes in successive matches in January, at Sheffield United in League One and at home to Preston in the FA Cup. The 19 year-old impressed during the FA Cup draw with West Brom at the ABAX Stadium, but struggled to replicate that form in League One matches. Posh don’t intend to use any loan players between now and the end of the season, apart from goalkeeper Mark Tyler, who will sign a permanent contract in the summer. Norwich left-back Harry Toffolo is understood to have returned to Carrow Road a fortnight ago.